Find a moment of peace and pleasurable discipline. Good posture, breathing, being fully present. Relaxing mind and body. Open to all. Meditation practice open to all. Instruction is offered. What does it mean to speak from our experience of the present moment? Stroke practice. For authorized students. Basic Goodness Series part 2. With prerequisites ( 6 classes). In french. Meditation practice open to all. 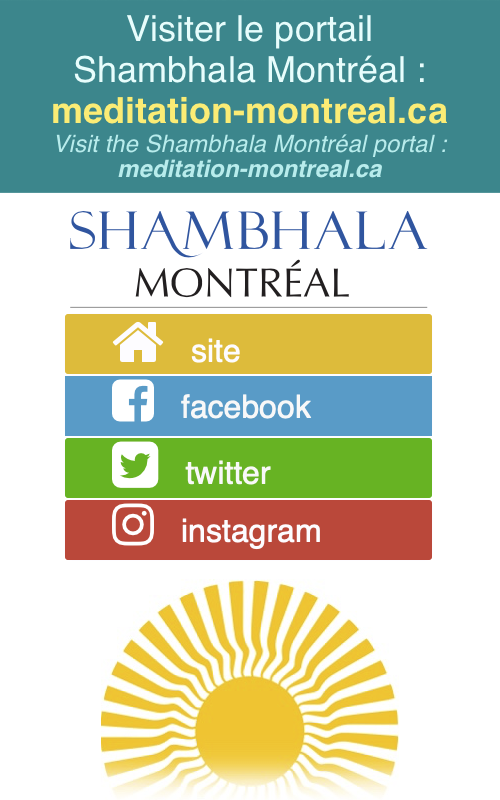 Online Program (6 weeks) at Shambhala Centre. You may participate in one, two or all the talks. Two sessions of practice, contemplation and study on the notion of Guru Yoga in April and May. For tantrikas. Meditation in action inspired by the Path of Service. Free Trainings for Umdze/ Gatekeeper / Coordinators. For members. Series of 5 talks followed by discussion. Public program. No need to register in advance. The instruction is given in french and in english simultaneously. Meditation, maitri bhavana, contemplations and discussion for developing unlimited kindness. Open to all. Community gathering and practice of the Shambhala Sadhana for all members. Morning of meditation practice. Open to all. How do we go out of the cocoon of our fear? Prerequisite Shambhala Training Level I: The Art of Being Human. You are all warmly invited to celebrate the summer solstice with a picnic / BBQ at Laurier Park, our centre’s "back yard" ! Silent retreat (one week) to deepen the benefits of meditation. Registration mandatory. Prerequisite: Fearlessness in Everyday Life. Find a moment of peace. Good posture, breathing, being fully present. Relaxing mind and body. Open to all. Pacify the Turmoil of the Mamos. Practice open to Members of Shambhala Centre.